As I've documented on my blog previously, I've had my fair share of skin problems throughout my twenties and I'm always on the look out for products that will get my skin clear and keep it clear. Over the years I've tried a lot of the drug store products from the UK and the US but none of them have helped much. I was drawn in by marketing that promised clear skin, I pounded my skin with chemicals to try and clear my skin but in reality I stripped it of its natural oils which resulted in my skin becoming greasy, which in turn did not help the spots. Recently I've been on the hunt for natural (and where possible, organic) skin care products. 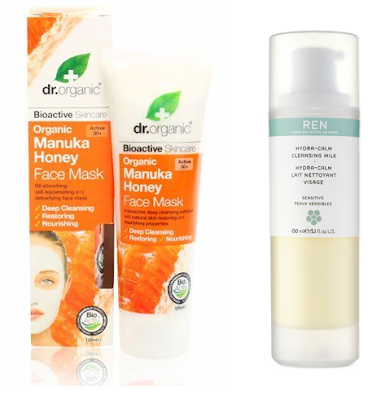 A few weeks ago I popped into Holland Barrett on my lunch break and picked up the Dr Organic Organic Manuka Honey Face Mask as a colleague had been raving about manuka honey and how amazing it is. I was thinking of buying a pot of manuka honey to use directly on my skin, however I found the price prohibitive. Instead I went for the manuka honey mask as it's a mix of the honey and Kaolin (China Clay), I figures that putting both of these things on my affected area (I've only been using it on my chin) would be good. So far I've been impressed with the results, immediately after using the mask my skin has been smoother and any redness has been soothed, I've taken to using it in the morning twice a week prior to applying my make up. On a few occasions when I've used it in the night, the following morning I've woken up with a small breakout. This hasn't worried me as it's the clay drawing out the impurities in my skin, which is good! I've also been using the REN Hydra-Calm Cleansing Milk and quite frankly it's been a revelation. In the space of two weeks I've seen a vast improvement in my skin, I'm now down to one breakout (more of a cyst really) on my chin. Areas that were dry and flaky before I used it are now calm and smooth. I'm really, really shocked by the turn around in my skin since I started using it, in fact after only using it once I noticed an immediate difference. Thanks to my success with REN I've been spurred on to find natural skin care products. I toddled off to town on Saturday and headed straight for John Lewis in order to track down the REN counter. Sadly when I arrived in the beauty department I discovered that the Cardiff store only stocks a few REN items and there was no one around to speak to and to get a sample of the Hydra-Calm Day Cream that I really wanted to try. Thankfully they have a super friendly twitter account and I've now had an email from their customer care service to say that they're sending me some samples to try. Whilst I was in John Lewis I picked up samples from Clarins after their Gentle Day Cream was recommended to me, the Mega-Mushroom serum and day cream, Liz Earle's day cream and the Keihl's Hydrating Moisture Emulsion. After doing a bit of research I've also found a couple of natural or organic skin care companies that I may order some samples from: Aromawakening, Earthbound Organics, Akamuti and Conscious Skincare. I'm very glad it's pay day! Hopefully in the coming weeks I'll be able to find the perfect regime for my skin, until then I'm tester pot central. Do you know of a natural or organic skin care companies that I should look into on my quest for healthy skin? Yes! Natural has really made strides in my skin. My current regimen is almost all natural stuff. My esthetician swears by it, and I've seen nearly flawless skin if I actually remove dairy from my diet (it's hard!). http://skinbymarywynn.com/products/buyproduct That's most of the products they use. I'm on the Tu'el Cleansing Gel, Clear Skin Ultra Gel, Oil Free Hydrating Fluid, and Tizo3 SPF 40 during the day; at night it's the same cleansing gel, Tu'El Glyco-A Gel, Kiehl's Midnight Recovery Concentrate (not from them), more hydrating fluid, and Kiehl's Avocado Eye Cream (again from Kiehl's not them). I use the Purifying Comfort Mask when I actually experience a breakout. I've seriously got my skin under control save for the dairy thing. Eliminating soy also helped a lot. I had a cappuccino and frozen yogurt on Saturday, and by yesterday I was sporting two huge zits on my chin. I do get facials every six weeks to keep an eye on things and stock up on product, but it's almost not necessary.